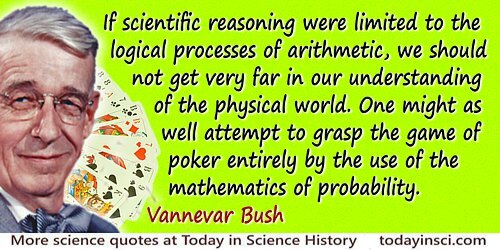 If to-day you ask a physicist what he has finally made out the æther or the electron to be, the answer will not be a description in terms of billiard balls or fly-wheels or anything concrete; he will point instead to a number of symbols and a set of mathematical equations which they satisfy. What do the symbols stand for? The mysterious reply is given that physics is indifferent to that; it has no means of probing beneath the symbolism. To understand the phenomena of the physical world it is necessary to know the equations which the symbols obey but not the nature of that which is being symbolised. …this newer outlook has modified the challenge from the material to the spiritual world. Swarthmore Lecture (1929) at Friends’ House, London, printed in Science and the Unseen World (1929), 30. In the physical world, one cannot increase the size or quantity of anything without changing its quality. Similar figures exist only in pure geometry. In W.H. Auden and ‎Louis Kronenberger, The Viking Book of Aphorisms: A Personal Selection, (1966), 98. Physics is mathematical not because we know so much about the physical world, but because we know so little: it is only its mathematical properties that we can discover. In The World within the World by John D. Barrow (1988). Physics tells us much less about the physical world than we thought it did. The earth's becoming at a particular period the residence of human beings, was an era in the moral, not in the physical world, that our study and contemplation of the earth, and the laws which govern its animate productions, ought no more to be considered in the light of a disturbance or deviation from the system, than the discovery of the satellites of Jupiter should be regarded as a physical event in the history of those heavenly bodies, however influential they may have become from that time in advancing the progress of sound philosophy among men. In Principles of Geology, Being an Attempt to Explain the Former Changes of the of the Earth's Surface, by Reference to Causes Now in Operation(1830), Vol. 1, 163. From 'Introduction', The Nature of the Physical World (1928), vi. Science and Culture, and Other Essays (1890), 335. There is not wholly unexpected surprise, but surprise nevertheless, that mathematics has direct application to the physical world about us. Why, it is asked, since the scientist, by means of classification and experiment, can predict the “action of the physical world, shall not the historian do as much for the moral world”! The analogy is false at many points; but the confusion arises chiefly from the assumption that the scientist can predict the action of the physical world. Certain conditions precisely given, the scientist can predict the result; he cannot say when or where in the future those conditions will obtain.